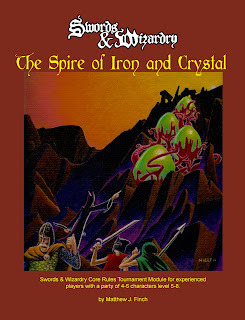 The Spire of Iron and Crystal is the second adventure module by Matt Finch released by Mythmere Games for use with Swords & Wizardry. Unlike its predecessor, the introductory Tomb of the Iron God, this module is intended for use with characters of somewhat higher level (5-8). Also unlike its predecessor, which drew solely on traditional swords-and-sorcery ideas and imagery, The Spire of Iron and Crystal has a slightly more science fantasy feel to it, which contributes greatly to the delightfully peculiar ambience the book exudes, from its superb cover by Peter Mullen to the interior art by Jeff Preston and author Matt Finch himself. Indeed, I'd go so far as to say that the main attraction of this adventure, above and beyond its obvious use in challenging a party of 4-6 S&W players, is its eerie, not-quite-right atmosphere. There's an unnaturalness to the module's locale that comes through very powerfully in reading the text. I was reminded a bit of having read The Vault of the Drow, with its depiction of the "dark fairyland" of Erelhei-Cinlu, which I consider a masterpiece of High Gygaxian prose. The difference, though, is that, like a good weird tale from days gone by, The Spire of Iron and Crystal conveys that unnaturalness slowly, bit by bit, making it impossible to point to a single passage or section of the text that encapsulates the overall feeling I came away with after having read it. That makes it difficult to explain, even in a lengthy review, precisely why I liked the module so much. On the face of it, The Spire of Iron and Crystal is much like dozens of other modules over the last 30+ years: the characters head off to investigate a mysterious location reputed to hold dangers and fortune and from which no others have ever returned successfully. The location in question is the eponymous Spire of Iron and Crystal, "four massive, egg-shaped crystals are mounted into a twisting, ornate structure of rounded metal girders, one crystal at the top and the other three mounted lower down." As one might expect, the Spire's four levels are inhabited, but these inhabitants are (mostly) creatures unlike any the characters have ever encountered before. Consequently, the module includes nine new monsters, including the korog, a prehuman race of subterranean beings that built the Spire. The Spire of Iron and Crystal is a "pure" adventuring locale. Although there is a brief backstory about the korog and the original purpose of the Spire, very little of that comes into play unless the referee wishes it to do so. There are no essential encounters, boxed text describing your character's feelings about this eldritch place, or dramatic speeches by the Big Bad Evil Guy. What you get instead is an extremely well presented dungeon filled with weird magic and technology, clever traps, deadly monsters, and commensurate rewards. Yes, there's some great potential here for expansion. I can easily see using this module as the kick-off of an extended campaign involving the korog and their underground civilization, but, as written, the module makes no demand that the referee or the players be interested in such things. The Spire of Iron and Crystal is thus a fine modern example of the location-based approach to adventure design that gave birth to some of the best modules in D&D history. Retailing for $9.95, this is an excellent mid-level adventure module for referees looking for a slightly more outré locale into which to throw the characters in their campaign. I suspect it will prove a very difficult challenge for many players. Finch pulled out all the stops in writing this one, creating both a truly memorable environment and filling it with obstacles to test even experienced players. If I have a complaint about The Spire of Iron and Crystal, it's that it feels a little cramped. I kept expecting there to be more than its four levels (most of which have only 15-20 rooms), but that probably speaks more to how much I enjoyed it than to any deficiencies in the text itself. And, as I said, the module gives more than enough hooks on which to hang many more follow-up adventures -- high praise for any module, especially one as unique and evocative as this one. I'm a bit disappointed that you didn't mention the spiffy Chivalry & Sorcery-inspired cover, which I'm sure you noticed. James, how much work would you think is involved in using this adventure for some other, related game? Say, Castles & Crusades or Labyrinth Lords, for example? Nice review, I was going to buy it this week anyway, but that review really makes it sound all the better! Philotomy Jurament and myslef had the good fortune to be allowed to playtest this one with Mr. Finch as our DM and we were definitely weirded out! There is some freaky stuff going on inside those crystal eggs! If you're looking for Old School vibes this is how it's done. I'm a bit disappointed that you didn't mention the spiffy Chivalry & Sorcery-inspired cover, which I'm sure you noticed.the cover is awesome and was mentioned in the first paragraph of the review while talking about the sci fi vibe exuding from the module "... from its superb cover by Peter Mullen to the interior art...". I would certainly think twice before plunging into those alien eggs! I'm seriously thinking about buying this for the reading pleasure; I don't think I could fit it into my (already higher level and pretty well fleshed out) current campaign world but it looks too cool to pass up. @ Anthony: While I haven't seen the adventure itself, I can say that there should be little to no issues using any S&W product with Labyrinth Lord or C&C. Mutual compatibility between various editions of D&D is one of the big selling points of both S&W and C&C. S&W even has alternate Armor Class numbers for people using C&C, 3.x, BFRPG, and 4e style AC. Running this adventure in playtest, it's the most fun I think I have ever had as a DM. From the moment things started, the players' faces were absolutely shocked - you could see an almost panicked level of suddenly ratcheting up the mental gears into high. And the actual experience of seeing two peoples' jaws really drop, simultaneously (yes you did, guys!). Thanks, Chris. That's what I suspected. @Matt: I seem to recall that happening more than once. I love that science fantasy in D&D is winning popularity! Mullen is quickly becoming my favorite new artist. Just brilliant. Keep the amazing art coming!! Hmm. I'm not sure I noticed what you're referring to, which is no surprise, since, like T&T, I had little direct experience of C&S until very recently. Care to elaborate? Hm. What sort of Sci-fi elements, exactly? Not ray-guns. Remnants of a weird quasi-technology/magic. In fact, I wouldn't call it sci-fi at all, although "science fantasy elements," I suppose, might be accurate. It all stems from something under the ground, not in the stars. Being a T&T fan, and not a puritan D&D gamer, I really welcome some science fantasy and other "weird" stuff. Good I haven't ordered Knockspell #2 yet, it seems the order will include more stuff. @Andreas: Don't forget: type MAYCONTEST10 into the coupon code area for 10% off. Thanks for the reminder, Matt! For those unfamiliar with C&S, the cover layout of The Spire of Iron and Crystal is highly reminiscent of the look of a number of C&S products, and the S&W logo on it is directly in the style of C&S's logo. The logo on the S&W core book is very similar, of course, but in this usage, complete with the black background, I think it's a clearer and more obvious homage.